Without a doubt you've come to the right place for dirt bike helmets. MotoSport carries nearly 300 dirt bike helmets from 29 manufacturers. 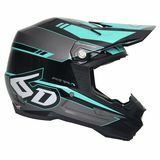 Modern technology and research pack every one of the dirt bike helmets we stock with features to help make a long day at the track or on the trail safer and more enjoyable. 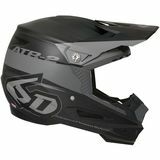 Every motocross helmet you find on MotoSport.com comes with Department of Transportation (DOT) approval. The Department of Transportation developed the standard test for helmet safety. What's more, many of the helmets you find here also come with Snell approval. For dirt bike helmets to achieve the Snell approval, manufacturers put their helmets through an approval process even more stringent than the DOT process. Take comfort in knowing the helmet you get at MotoSport is one of the safest available anywhere. If you've spent any time on the track you've noticed some of the wildest colors and graphics ever seen on a dirt bike helmet. Today's dirt bike helmets feature a range of available colors and designs never seen before. First select the right dirt bike helmet for safety and then match it to your taste, or your riding gear or dirt bike graphics. The greatest part about today's helmet technology is the availability of great features at incredible prices. No longer do you need to spend a lot of money to get the features and graphics on a high quality dirt bike helmet. With so many available dirt bike helmets we can certainly help you find the right one based on your budget, experience and where you ride. So give us a call 866-677-7338, chat with an expert or check out our Dirt Bike Helmet Buying Guide. In addition to our vast selection of dirt bike helmets you can also find other safety gear on MotoSport like goggles, boots and gloves. MotoSport is the best place to find dirt bike helmets. We have a 90-day return policy. Use the size charts to help you take the guess work out of selecting your product. Even if a product doesn't fit, our hassle free return policy means we make it easy for you to get the right one.